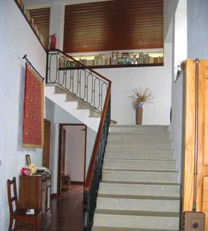 Casa Torga is placed in Aldeia Velha, near Serra da Malcata, close to the border of Vilar Formoso, the historical village of Almeida and the medieval village of Sortelha. Come visit these villages with granite houses and fresh smell of the fields. Casa Torga is situated in Aldeia Velha, Sabugal, district of Guarda, in the lands of Riba-Côa, between Serra da Estrela and the border. The village is crossed by one of the subaffluents of Rio Côa - Rio Cesarão - and possesses bushes of oaks and "castanheiros" that come along till Serra da Malcata. By this lands, is still frequent to glance foxes, the hares, the rabbits and the wild boars. The lynx of the Malcata is, unhappyly, already very rare. The tranquility of the landscape, the delicious food and the friendly shelter of the people provide to the visitor precious moments of leisure and welfare. These are some of the reasons to visit Beira Interior.